Parade Line-up location: 34th Ave. between Fernbrook and Plymouth Blvd. In past years, we have been told we will probably be in the Plymouth Creek Center parking lot. 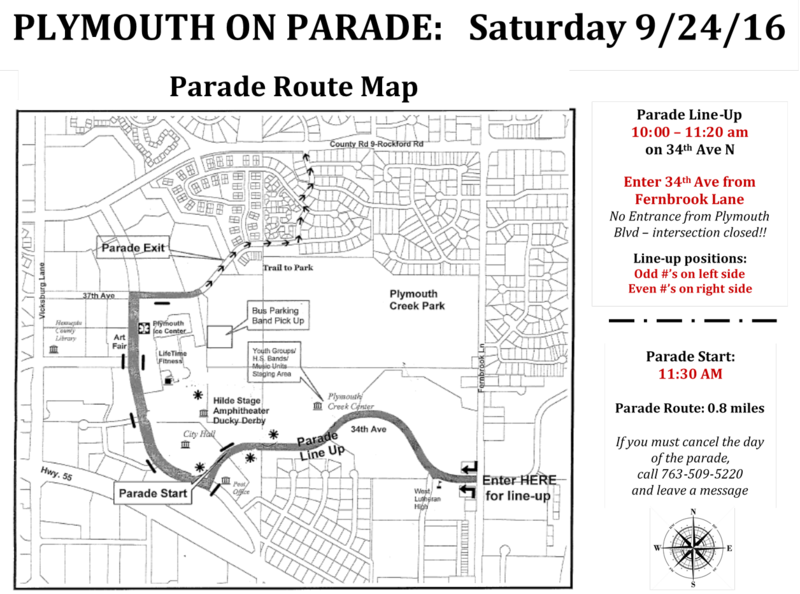 Parade Route: The parade is slightly shorter than in previous years (the end has changed). See the official map. Parade length 0.8 miles. Mike S: In 2013 I parked at the park that is midway between the beginning and end (Plymouth Creek Playfield?) and rode the bike paths to the line-up, and then to my car after the parade. The organizers recommend this lot as a good spot to park – and they use it as the animal unloading area for those units. Emily: Parking is often also available at the lineup location in the Plymouth Creek Center parking lot. Enter 34th Ave from Fernbrook. There is a nice trail to ride back your car after the parade.